After a discussion about the popular A & E show “Horders” yesterday I decided that after my shoot it might be a good idea to chip away at the “goals” from my 2010 list of things to do. Though I personally have never seen the show, far too many people have mentioned it to me, creating what I can only say as a slight paranoia in my head about my own mounting paper trail. Which led me to purge a tub… yes a giant plastic tub of tear sheets from photo shoots I have done over the years. 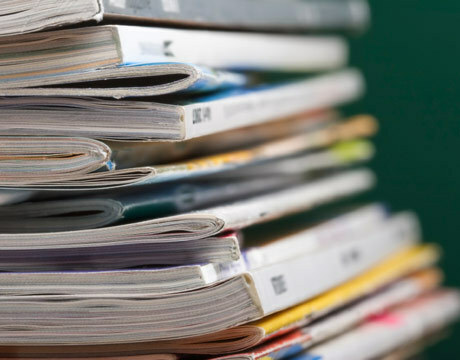 Though I generally keep at least one copy of every editorial, catalog, ad campaign etc I have done, I often go overboard and find myself hording at least three to four copies of each which of course ends up being nothing but a fire hazard. So as I walked through what seemed like the ancient history of my career I couldn’t help but have a laugh at some of the trends that have passed our closets over the years. This year will no doubt provide it’s own foder when I decide to unclutter years from now but at the moment, I can say that I love to direction some of these trends are taking us…at least for the next twelve months. 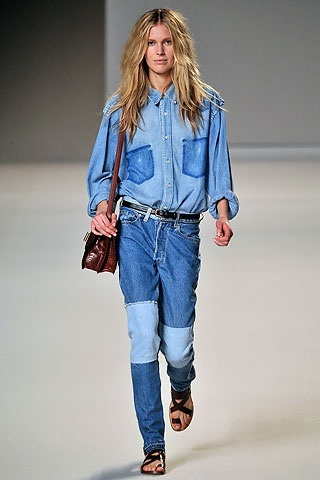 To go along with the turquoise shades, gel mani’s and longer hemlines of yesterdays post this year strong denim statements will continue to abound with the advent of new brands like Cheap Mondays and the latest line of progressively tailored denim from Helmut Lang topping the list. And expect patchwork denim to see a revival not experienced since the 70’s. 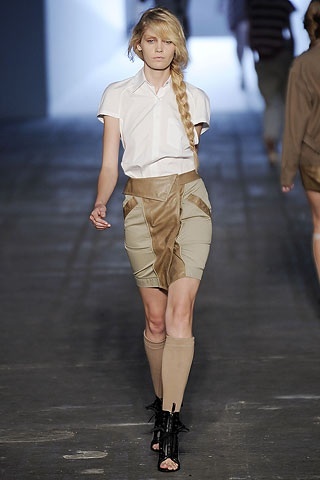 Sports influences, we first mentioned this little trend right after the Spring runway shows occurred and we expect to see lots of shoulder padding mesh netting and other “sportsman” like details led my our guy du jour Alexander Wang. Though I must caution this trend is not for the faint of heart and may not be the perfect office attire, surely there are tid bits that everyone can enjoy from this look. I personally will be crossing my fingers that Mr Wang does not spawn a new round of midriff baring and Juicy tracksuit replicas over the next year. In the accessory department patent leathers and Lucite accessories are still hanging on strong through this year and we may begin to see little trims of the glossy textures popping up the most interesting places. Just in time to save the arches of women across the nation,though we love our sky high heels lower heels are making a comeback. Flats and kitten heels will have a big showing once again and I predict we will learn to love the kitties just as long as no one goes the same route as Marni on the runway with socks…meow! Wow i don’t know if I can make the transition to kitten heels. I very much like my very high heels. I just love kitten heels! This is great news. 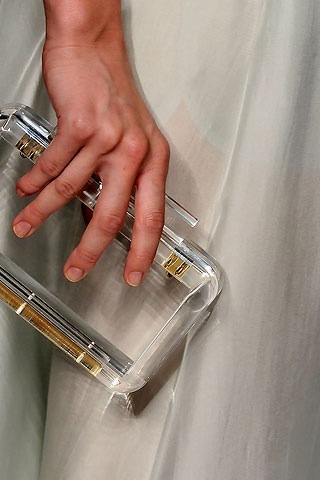 Love the Prada purse, but your items to carry had better be very chic with a Lucite clutch! Purging a year’s worth of magazines myself, Diane. How does this stuff add up!!!??? Yeah for flats and kitten heels! For some reason, I always feel so awkward in tall heels. Kitten heels are far more adorable. So excited for kitten heels, but definitely a NO NO with socks! !